The Wildcats have a lot to be proud of as the team begins 2016. 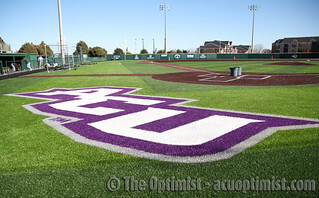 With the new renovations to Crutcher Scott Field, ACU can arguably be considered home the best baseball facilities in the Southland Conference. Head coach Britt Bonneau enters his 20th year at the helm for ACU baseball, where he has accumulated a 706-398-1 record since taking over in 1997. And the Wildcats battled and kept pace with several of the best programs the nation has to offer. Entering their third year as members of the Southland Conference, Bonneau and the Wildcats will look to compete for the top of the conference with a roster of Div. I caliber and experienced players. ACU finished 2015 with a 17-38 overall record and a 13-17 record in conference, ranking ninth out of 13 teams. Seniors Garrett deMeyere, Nate Cole and Aaron Mason will anchor the Wildcats rotation this season. In 2015, deMeyere posted a 4-5 record in 14 starts with a 5.18 ERA. Cole and Mason combined for a 5.79 ERA in 14 starts for 97.1 innings pitched. Sophomore Drew Hanson should receive more time as a starter after a solid freshman campaign. In 94.4 innings as a starter, Hanson had a 3.86 ERA while giving up 13 runs on 25 hits while striking out 21 batters. Bonneau and his staff have the challenge of replacing former pitching staff ace Thomas Altimont (3-8, 3.68 ERA, .268 opp. avg.). Junior Mack Morgan could jump into the starting rotation, along with either junior transfers Caleb Dougherty or Zach Kornely. In the field, the Wildcats will be led by two seniors and two juniors. Seniors Kyle Carroll and Alex Copeland will be your everyday shortstop and catcher as they’ll be the generals out on defense. Carroll split last season between shortstop third base and even came out of the bullpen a few times for Bonneau. He ended 2015 with a .215 average with 16 RBIs in all 55 games last year. Copeland was fantastic for the Wildcats behind the plate, giving up just one error in 48 games, while posting a .259 average with 25 RBIs and a .326 on-base average. Juniors Aaron Draper and Russell Crippen will look to improve in their third season of Div. I competition. The second baseman Draper was second on the team last year with a .280 batting average out of the lead off spot and 35 runs scored. He also added a .331 on base percentage. Crippen gives the Wildcats power in their lineup and should see his home run totals increase from the four he had last year with the moving in of the outfield wall at The Crutch. Crippen ended 2015 with a .262 average, 29 RBIs and a .367 slugging percentage. This year, the utility player will start in center field and look to move back into the infield later this season. The Wildcats will start their season in Abilene for the fourth time in the last five years. They’ll host Texas-Rio Grande Valley for four games before traveling to Norman, Oklahoma to play the Sooners in a one-game series. ACU will return home to play Northeastern for four games and will then hit the road to Thibodaux, Louisiana for their first Southland test of the season against Nicholls State. Bonneau has earned a reputation of forcing his guys to take on some of the top programs in the nation. Last season, the Wildcats proved that they could play with the best of them, staying close in several games. 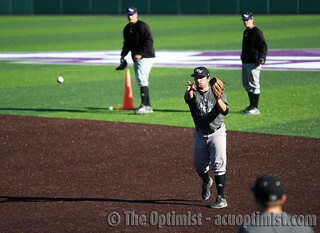 Against Nevada, the Wildcats came up short 9-6 and 3-2, and against the University of Texas-Arlington, ACU lost both games by two runs, 3-1 and 7-5 on the road. Some of the most memorable moments of last season came against two of the top teams in the state. No. 12 Texas Christian University barely squeaked by ACU in a 4-3 game, and Texas Tech needed 16 innings to bury the Wildcats in a 6-5 classic. Not all games against top programs ended in losses for ACU. The Wildcats grabbed their second-to-last win of the season against Arizona in Tucson on a 2-1 final score thanks to six strong innings from deMeyere.